The St. Paul Warriors are headed back to the IIAAG Girls Basketball Finals after powering through the Guam High Panthers in the semifinals Tuesday evening at the UOG Calvo Field House. In the first game of the semifinals double-header, the Warriors deployed their tricky press defense as they swarmed the Panthers to punch their finals ticket winning 69-30. 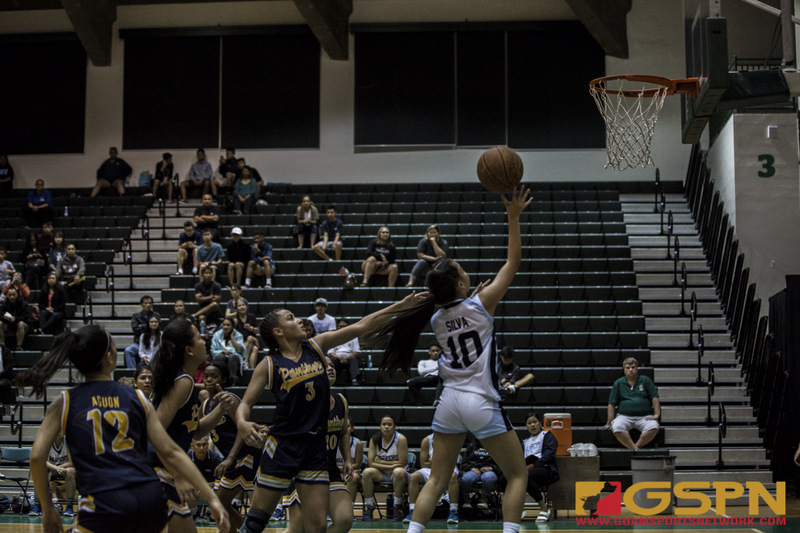 The Academy Cougars defeated the GW Geckos 56-49 in the second game, setting up a second straight St. Paul vs. Academy IIAAG Girls Basketball Championship. Guard Kirsten Silva was the leading lady for the Warriors netting 22 points as St. Paul stretched a 20-9 game in the 1st quarter to a 36-14 halftime score with the Panthers biggest threat in Taneea Henderson sitting out with early foul trouble. Henderson picked up three fouls forcing her to sit out the entire 2nd quarter where the Warriors outscored the Panthers 16-5. “We made better shot selection and attacked the rim to try and create as much points from the free throw line as we can. We created a lot of opportunities to score today from the fast break and we noticed they weren’t really protecting the middle so our goal was to get to the rim,” said Silva on the approach. Taneea still led the team in scoring with 13 points while the Warriors got 13 points from Jan Quintanilla. Henderson is also the teams main ball handler, which presented problems for Guam High as they struggled to figure out the Warriors press with talented freshman Taneea in foul trouble. “[Taneea] is an awesome player, love her, and I think she’s one of the top three guards in this league. So obviously when we’re facing that kind of talent, your game plan is to stop her. But we just played the way we play regardless of who’s on the court. We always want to speed up the tempo and push the pace on both sides,” said Warriors head coach Paul Pineda. The Panthers got a short burst of Henderson’s offensive skills in the 3rd quarter going on a 7-0 personal run to get within 38-20. Guam High’s Aniah Cruz converted on three from the wing to cut the lead 40-26 with 2:30 left to play in the 3rd, but another foul from Henderson on a charge a moment later forced head coach Joe Taitano to sit her after picking up her fourth foul. Silva would break free scoring six points, all off turnovers, as St. Paul squashed the possible Panther comeback to end the quarter on a 9-0 run for a 49-26 lead. The Warriors emptied their benches in the 4th as plenty of crowd favorites got into the scoring action. St. Paul has already put their semifinals win behind them as they have their sights set on bringing home their second straight IIAAG title. The Warriors went undefeated in the regular season winning each game by double digits, but Pineda and the coaching staff aren’t about to let the team get complacent now. “We never look at the score and we tell the girls that ‘the enemy of success is success’. So our challenge as coaches this week is to still have these girls motivated and make sure that they aren’t taking it easy just because they’ve won every game so far. As we preach that, I’m sure our girls will come ready Friday,” said Pineda. Silva was on the Cougars last year where she suffered a heartbreaking loss to some of her now teammates. Her Warriors teammates love to bring up that fact, so winning one this year with her new team has made her the most title-hungry of them all. The Championship game is set to go down on Friday at 7 pm following the consolation game between the Panthers and Geckos.